Last week I had made Chocolate cake when friends were over for dinner. I had a bit of cake scraps left over from trimming the cake before I frosted it. I didn’t want to throw out perfectly good tasting cake. 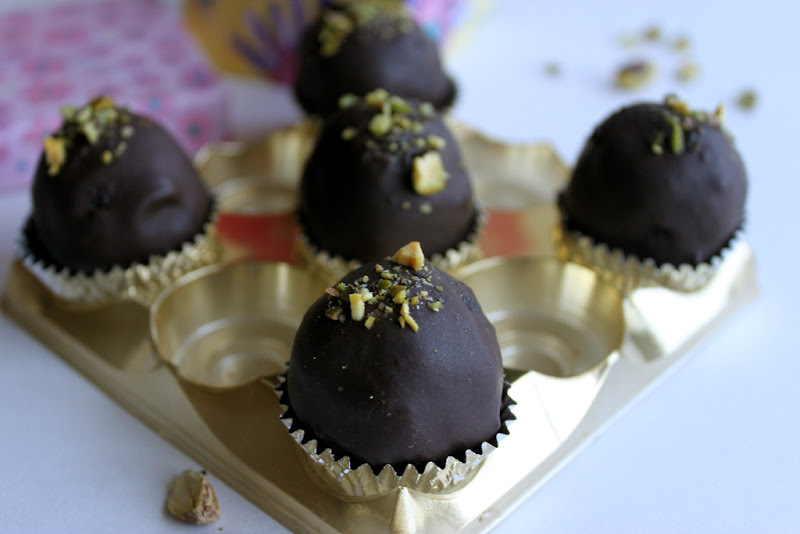 Cake Truffles are like Chocolate Truffles, only made differently. They are cake crumbs rolled up into a ball, frozen and then dipped in melted chocolate, and chilled. These bite-sized desserts are elegant and perfect for any occasion. You can use any flavor cake, mix two flavors or jazz it up any way you want. Place cake crumbs in a glass bowl. Drizzle heavy cream on top and combine. The mixture will be wet and slightly sticky. Make even sized balls and place on a baking sheet lined with wax paper. Freeze for 4-6 hours. Roughly chop the three types of chocolate and place in a small mixing bowl. Bring a small saucepan of water to a simmering boil. Place mixing bowl on top, taking care that the water does not touch the bottom of the bowl. Add the heavy cream and corn syrup over the chocolate. Stir until chocolate has melted and you have a smooth, shiny mixture. Remove from heat and cool slightly. Drop one cake ball at a time into the melted chocolate and using forks roll it around to coat evenly with chocolate. Remove and return to the wax-paper lined baking sheet. Repeat until all the cake balls are covered in chocolate. 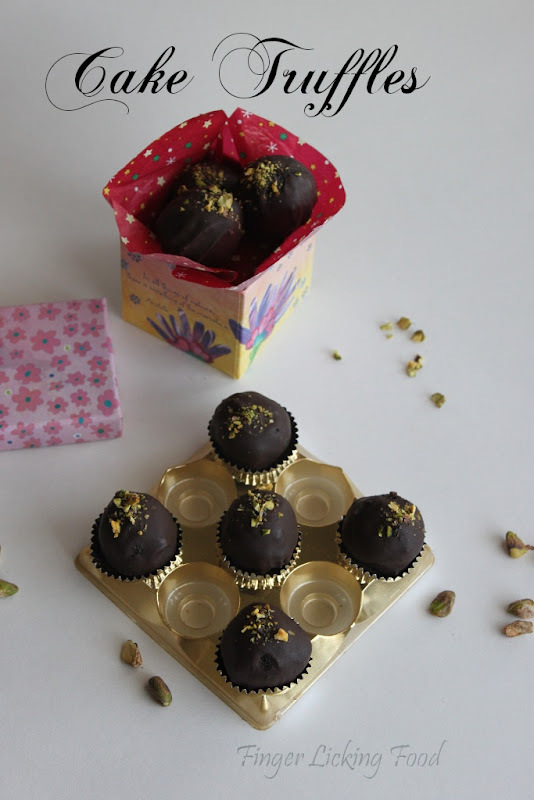 Sprinkle a little of the chopped pistachios on each truffle. Any topping you choose, now is the time to use it. Return baking sheet to the refrigerator till chocolate is set and the balls are thoroughly chilled, 2-3 hours. The chocolate coating was very mellow because of the dark chili and semi-sweet chocolates. It complimented the chocolate cake inside instead of making it overly chocolatey. Don't forget to save those scraps the next time you bake a cake, a quick-fix dessert is right up your alley. Wow!!!!! absolutely mouthwatering...I feel like picking up some right from the screen and enjoy!!! Absolutely delicious! 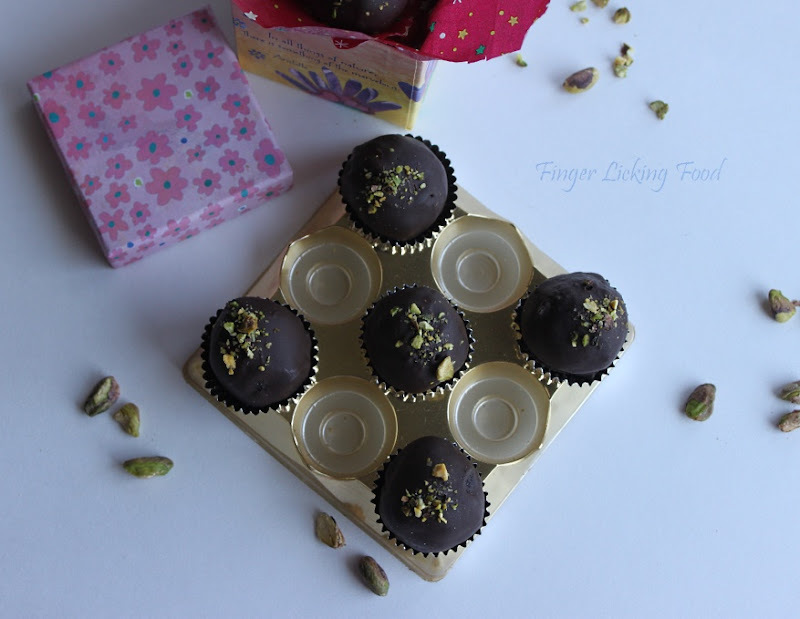 lovely and tempting cake truffles. 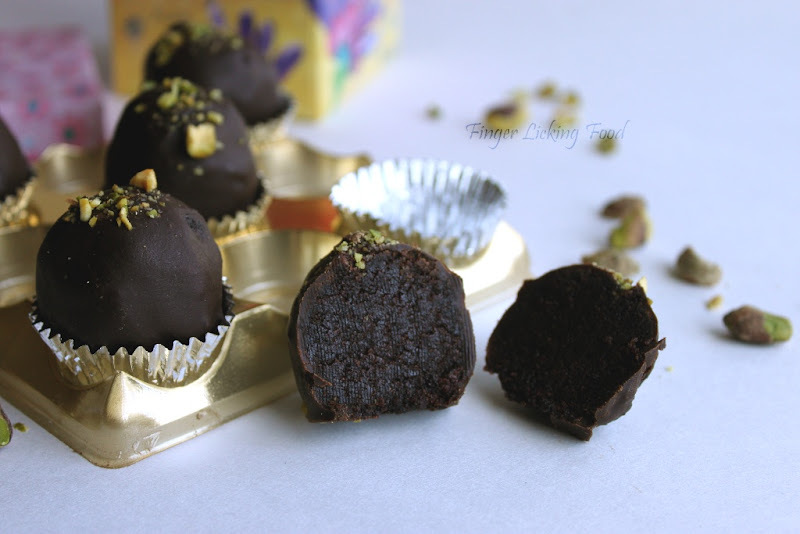 Cake is excellent idea for truffles, they are gorgeous! excellent idea, i am always left out with some cake and dont know wat to do, this is an excellent idea.Can the heavy whipping cream be substituted with milk or condensed milk?TIA. Nice presentation and lovely clicks! 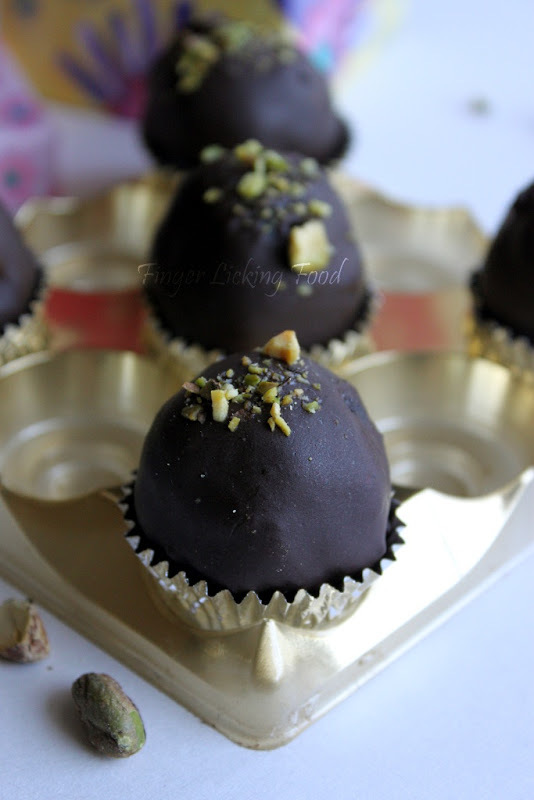 DElicious looking truffles, very yummy and mouthwtaering!!! Wow such a tempting truffles...fantastic.. I had no idea that we could make truffles with cake - interesting... I recently made them with cream cheese tho. do you have similar recipe without egg?